Every year at the palace on the scenic Kona waterfront the Daughters of Hawaiʻi hold a wonderful celebration in honor of Prince Jonah Kuhio Kalanianaʻole. It is a day of Hawaiiana with emphasis on hula plus fabulous bake sales, lei making (and wearing) all in a garden setting unrivaled on the seashore in the grounds of the impressive palace building. However, at setup the weather was unkind and it was difficult to erect my display in the wind and rain. Quite unexpectedly with no coercion from me a strongly built, good looking young Hawaiian just came to my aid and it would had been very difficult to have succeeded without him. He would accept no reward and seemed only pleased to be of such help. 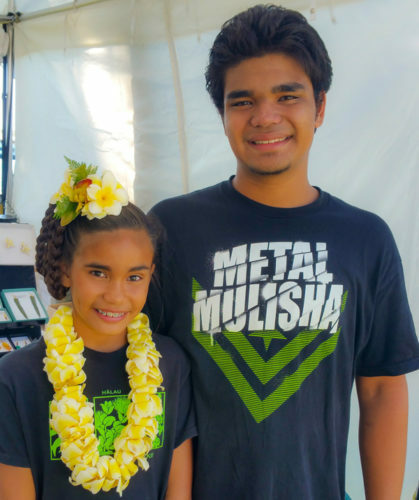 He had two other distinctions – one being the longest Hawaiian name I know Preston Kekaninahemaiukaikai Palos and the other a lovely younger sister, Chesney Kalokepuanani whose dancing he had come to encourage. These two were a delight and were a highlight of the show for me.